Native Range: Great Lakes, Hudson Bay (Red River), and Mississippi River basins from southern Quebec to southern Manitoba, and south to Louisiana; Atlantic Slope from St. Lawrence River, Quebec, to Roanoke River, Virginia (absent from most of New England); Gulf Slope from Mobile Bay drainage, Alabama, to Mississippi River (Page and Burr 1991). Table 1. States with nonindigenous occurrences, the earliest and latest observations in each state, and the tally and names of HUCs with observations†. Names and dates are hyperlinked to their relevant specimen records. The list of references for all nonindigenous occurrences of Pimephales notatus are found here. Means of Introduction: This species has been transplanted commonly by bait bucket release and sometimes stocked as a forage fish or introduced by way of stock contamination. 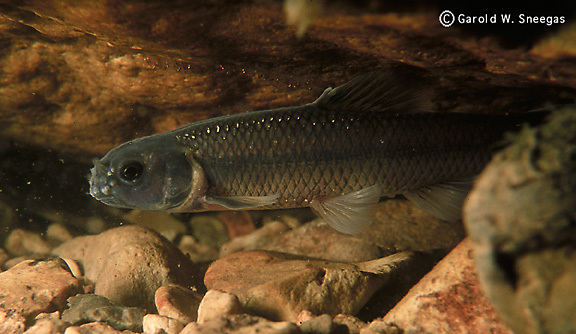 As indicated by Whitworth (1996), Pimephales notatus was introduced to a small stream in the Housatonic River drainage and that population was probably the source for other populations that have become established in other sites in the Housatonic drainage. Walters (1997) noted that the occurrence of this species in the middle section of the Conasauga River, Georgia, during the 1980s was probably the result of bait bucket introduction. Probably a bait bucket release in Massachusetts, it was first found in the Housatonic in 1979 and first noticed in Quabbin Reservoir in the early 1980s (Hartel 1992; Hartel et al. 1996). Trautman (1981) reported that, in addition to being propagated by bait dealers, Pimephales notatus was propagated and stocked throughout Ohio after 1925 by the state conservation department. He added that millions were seined annually from Ohio streams and sold and used as bait. Sigler and Sigler (1987) noted that it was introduced to Williard Bay Reservoir, Utah in 1982, but they did not provide additional details. Jenkins and Burkhead (1994) provided details on introductions, and possible introductions, for drainages associated with the state of Virginia. The presence of Pimephales notatus in the Potomac River drainage probably resulted from stockings, naturalization, and rapid spread. The first known record for the Potomac River drainage was from a Shenandoah River tributary in 1897. It was common to abundant in the lower Potomac by the early 1900s. Jenkins and Burkhead noted that it may have been used as forage in bass and sunfish culture ponds operated in Washington, D.C. by the former U.S. Fish Commission, and the species may have been disseminated with centrarchids. The first known record for the Rappahannock drainage was from 1972. In the James River, the fish was collected above the Blue Ridge in 1928; it may have been introduced with shipments of centrarchids and subsequently dispersed downstream. The first known record from the Roanoke came in 1947, the first from the Dan system (Roanoke drainage) in 1951. Jenkins and Burkhead (1994) interpreted the distribution pattern in the Roanoke proper and Dan systems of the Roanoke drainage to be the result of at least two introductions. Status: Established in nonnative areas in Connecticut, Georgia, Massachusetts, Ohio, South Dakota, Virginia, and West Virginia; reported from Utah. Impact of Introduction: Largely unknown. Based on 1989 shorefish samples, Hartel et al. (1996) found it to be the most common minnow in Quabbin Reservoir, Massachusetts. Possibly in reference to native populations, Trautman (1981) noted that the species hybridizes with Pimephales promelas and P. vigilax. Remarks: Page and Burr (1991) commented that Pimephales notatus is probably the most common freshwater fish in eastern North America. There is some uncertainty concerning the native versus nonindigenous distribution of this species. For example, Hocutt et al. (1986) listed it as introduced (but possibly native) to several Atlantic Slope river drainages including the Roanoke, James, York, and Rappahannock. In their summary table on Virginia fishes, Jenkins and Burkhead (1994) listed this species as introduced to the York River drainage. In addition, these researchers listed it as introduced (but possibly native) to the Potomac, Rappahannock, James, and Roanoke river drainages; and as native (but possibly introduced) to several Ohio River basin drainages including the New, Holston, Clinch-Powell, and Big Sandy. In their summary table on West Virginia fishes, Stauffer et al. (1995) listed it as introduced (but possibly native) to the Potomac and James river drainages; however, they did not find this species in the James River drainage within West Virginia. In their analysis of southeastern fishes, Swift et al. (1986) listed it as native (but possibly introduced) to the Escambia River drainage. Although considered native to much of the lower Missouri River drainage, Cross et al. (1986) listed this species as introduced to the White-Little Missouri River system. Most likely, their listing was based on a record from Flat Creek Lake record (northwestern South Dakota) given by Bailey and Allum (1962). Bailey and Allum noted that Pimephales notatus was presumably introduced to the South Dakota lake. Lee et al. (1980 et seq.) and Page and Burr (1991) apparently included this site in their range maps for this species; however, these authors did not distinguish the northwestern South Dakota area (nor any other area for that matter) as an introduction. Based on recent records, Walters (1997) listed Pimephales notatus as introduced to the Conasauga River system in Georgia. Such a conclusion is supported by the absence of any earlier records from the Coosa-Conasauga River drainage) (see distribution map in Mettee et al. 1996). Bailey and Allum (1962) stated that this species is common in Iowa in the Big Sioux, Floyd, and Little Sioux drainages; they noted that elsewhere in the Missouri River drainage it is rare and perhaps occurs only as a result of introductions form the Des Moines drainage. However, it is unclear what they mean by the term "introduction," for Bailey and Allum added that it seems evident that the species entered the middle Missouri drainage across the divide from the upper Mississippi. It is unclear if the many stockings and releases documented within Ohio represent true introductions or simply stocking of sites where the species was already present. Trautman (1981) noted that the species was apparently as widely distributed throughout Ohio waters before 1900 as it had been in recent years. In addition, at a broad geographic scale, Ohio is well within the boundaries of its native range. Nevertheless, it is likely that this minnow was introduced to sites within parts of one or more Ohio river systems where it was previously absent. Jenkins and Burkhead (1994) detailed the distribution of this species in Virginia (and surrounding areas) and discussed at length its native versus possible nonindigenous status in various Atlantic Slope drainages and certain upper Tennessee River drainages. They stated that the hypothesis that Pimephales notatus became established by introduction in certain Atlantic Slope drainages is supported by "its high esteem and availability as bait and often by the recency of first capture in drainages." A single specimen was discovered in a shipment of channel catfish Ictalurus punctatus sent to California from Arkansas in 1968, but the species has not been documented from California waters (Swift et al. 1993; Dill and Cordone 1997). Hartel, K.E., D.B. Halliwell, and A.E. Launer. 1996. An Annotated Working List of the Inland Fishes of Massachusetts. http://www.mcz.harvard.edu/fish/ma_fam.htm. Hocutt, C.H., R.E. Jenkins, and J.R. Stauffer, Jr. 1986. Zoogeography of the Fishes of the Central Appalachians and Central Atlantic Coastal Plain. In C.H. Hocutt and E.O. Wiley, eds. The Zoogeography of North American Freshwater Fishes. 161-212. Trautman, M.B. 1981. The Fishes of Ohio. Ohio State University Press Columbus, OH.